Stuff Points: Earn 29 points when you buy this stuff. Get five powerful pads in this money saving combo pack. If you're indecisive, have several floor types, or just want to prepare yourself for any type of mess, this is the package for you. 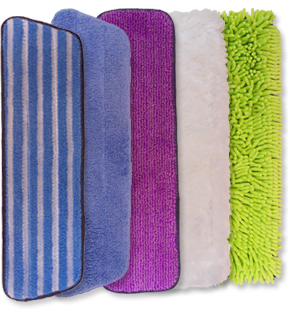 This combination set includes one of each kind, so it is the perfect addition to any microfiber mop. In this package you get five different 18" x 5" microfiber pads: The Multipurpose Pad, The Polishing Pad, The Scrubbing Pad, The Dusting Pad, and the Heavy Duty Chenille Pad. Each of these is uniquely designed for a specific floor type, or cleaning job in your home, and when you have them all, any type of grime is simple to clean. If this package is a little too much for you, we also have a 4-Pack that includes one less. With this five-pack, you will be prepared for a multitude of messes, and you will be able to thoroughly clean any floor in your home. Use the dry dusting one to dust mop your hardwood floors, or to remove hair from any hard surface. The scrubbing pad is great in the kitchen, bathroom, or other high traffic areas, so use them for those really tough mopping jobs. The material does the scrubbing, so you don't have to. Use the multipurpose pad all over, wet or dry, and for cleaning, polishing or dusting any floor. The Chenille pad offers superior absorbency, and many prefer to use it for dry dusting or soaking up spills. The Polishing Pad can be used wet or dry, and it will shine surfaces as it removes the dirt. Each of these is totally machine washable, and can be used hundreds of times before they run out. In many cases, you won't even need to launder after each use. After a light mopping, just rinse under warm water and then store on the mop for later use. When it finally gets totally dirty, put it in the washing machine for cleaning. Please Note: Never use bleach or fabric softener when washing your pads. Bleach deteriorates the fibers, and fabric softener clogs them. With prolonged exposure, efficiency will suffer, and replacement will become necessary. Made from a revolutionary thread that outperforms other options, these are not treated with any chemicals. The fabric alone cleans so well, that you only need to use water as a detergent to mop. It is the unique weave and composition of the microfiber that makes them clean so well. Masses of tiny fibers are woven together to create tons of surface area and cleaning power. The edges of each fiber will have microscopic hooks and loops that skim surfaces to gently scrub and lift up dirt. This eliminates the need for harmful cleansers and makes cleaning faster and easier. Don't waste money on inferior alternatives, and stop mopping with funky sponges and other tools that will never work as well. Use these high performance pads to save time, reduce effort and get your floors cleaner than ever. Get one multi-purpose pad, one polishing pad, one dry dusting pad, one chenille pad and one scrubbing pad. Prepare yourself for cleaning any mess on any floor of your home. Machine washable hundreds of times. An Effortless Way To Remove Dirt From Your Window Screens.